A beautiful one bedroom space, Villa BBE is the ideal romantic spot for those looking for a quiet holiday location with a view. With a partial separation between the living and bedroom areas, it is minimalism at its best. An open kitchen means simple meals the two of you will enjoy preparing as much as you do eating when you spend time together in the outdoor dining space. Designed to highlight the amazing view of the ocean below, the contemporary style is ideal as the two of you get to know each other on an entirely different level over your next vacation. Perfect honeymoon villa with fantastic ocean views! Located in Pointe Milou, St. Barts, Little Caramba Villa (BBE) is a one bedroom villa that can be rented individually or can be combined with the adjacent Caramba Villa (MBA) for the convenience of an additional two bedrooms both linked by a path through gardens. The living and bedroom areas share the same room with a partial separation between them. Large floor-to-ceiling windows provide a view of the ocean. The contemporary flair of the simple, minimalist decor is white with gray accents. The kitchen opens onto the dining area and is open to the outdoors. The kitchen is not equipped with a dishwasher. 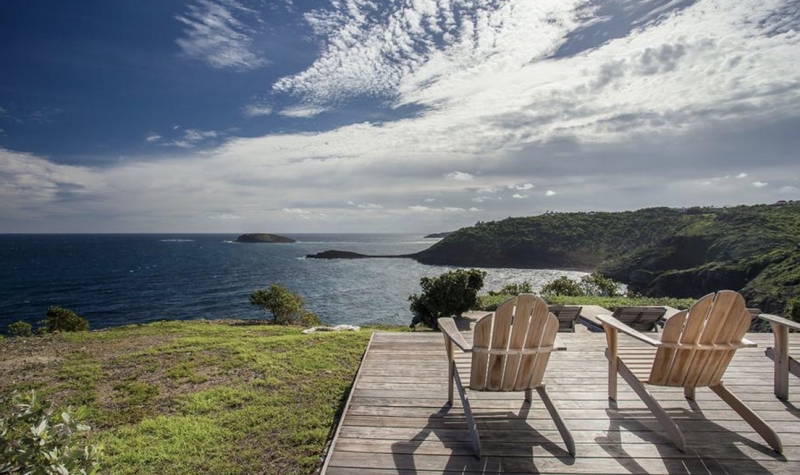 This villa is made for a couple who enjoys simple comforts with fabulous ocean views. BBE is complimentary with MBA over the Holiday.